Kehinde Wiley’s wildly successful career proves that as long as art history is alive, contemporary painting will never be dead. At the ripe age of 31, the Brooklyn-based artist has already achieved the unthinkable for most artists. 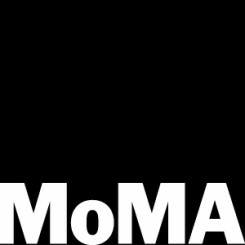 His large-scale, heroic portraits of contemporary African-American male youths, which reference three hundred years of iconic Western portraiture—as illustrated by Rubens, Valazquez, Ingres, Gainsborough and Sargent—have made their way into major museum collections, top collectors’ homes, an advertising campaign for VH1’s “Hip-Hop Honors” show in 2005, and even an interview on The Today Show with Matt Lauer in 2006. Harlem is where it all started for Wiley. It was during his artist-in-residence at SMH, after graduating from Yale’s MFA program in 2001, where he thought to ask the guys hanging out on 125th Street to pose for his paintings. Wiley found his MO, his painting purpose. He painted the anonymous models wearing their street dress – including baggy pants, hats worn sideways, etc.—in the same grand, heroic stances and positions that royal subjects, socialites, and politicians assumed in famous portraits by 18th and 19th century canonical painters, and to the same scale and style, which it is to say to a true-to-life size and against a royal-looking patterned background. Wiley has continued to put the spotlight on the identity of the African-American man. Or does he put the spotlight on the viewer as she stares at the man? Either which way, his work is compelling, visually arresting, and seductive. The take is international this time, as Wiley traveled to Laos, Nigeria—where he also reconnected with his estranged Nigerian father— and Dakar, Sudan for the 10 All the World’s a Stage portraits. The young African men whom he plucked off the streets and shopping centers were asked this time to assume the poses and stances of historical, public statues found in Nigeria and Sudan. 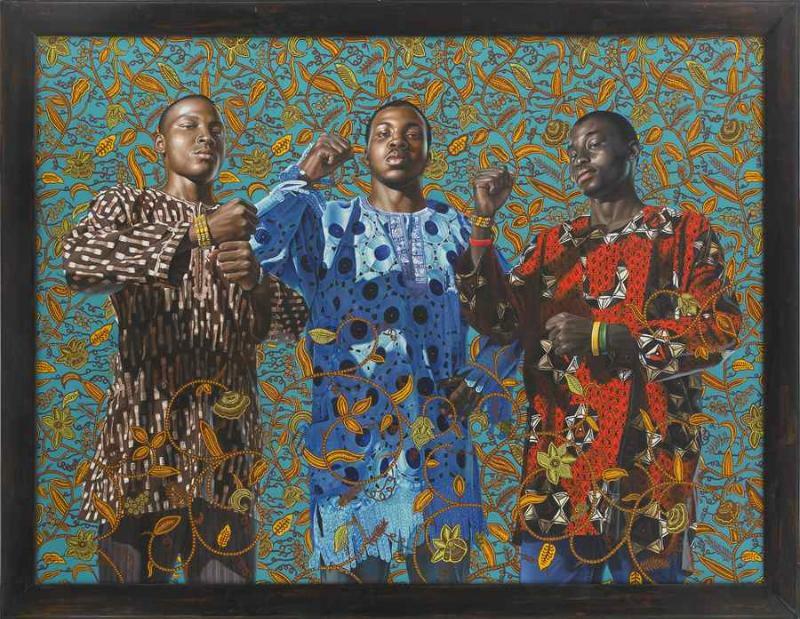 Though the subject is Africa this time, only in one painting do the three models wear traditional African garb—“Three Wise Men Greeting Entry into Lagos.” The mesh of African and Western themes continues in these works, yet the paintings are considerably different: they are toned down. In contrast to the portraits of African-Americans rendered in America, these poses are more subtle—with the exception of one raised fist to the air, the stances are quietly “proper,” as, apparently, African historic statues and African men tend to be—the models more timid and dressed less flamboyantly, wearing soccer jerseys or t-shirts, jeans, Tiva-like sandals or simple sneakers, and occasionally tribal-looking necklaces. 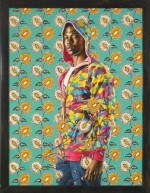 Rubin Singleton stands out as the most expressive of the bunch; the model wears a neon-colored camouflage hoodie and peers intensely back from under the hood. The frames are wood, whereas they have traditionally been gilded, but the have an awesome presence, as most portraits are at least 8’ x 7’ in size. Even the backgrounds, hand-painted as vibrant African textile patterns, are more controlled; they are less Baroque, less verdant, less dynamic, and without the kaleidoscopic punch that earlier hip-hop-influenced works have. To some, these African portraits may be more striking in their simplicity and may signal Wiley’s maturation into a more controlled, confident style. To me, they seem less exciting, with fewer conceptual contrasts, and too mild for a man whose paintbrush initially breakdanced across the canon of art history. Though, the relative quietness of these portraits do offer viewers the chance to really bask in Wiley’s most stunning skill – his ability to paint skin as luminous eye candy. Whereas Rembrandt’s focus was on his subjects’ eyes, Wiley’s is on the sheen of his subjects’ skin. Which is fitting of course, as skin color is one of the very reasons for these paintings. Controversy has followed Wiley’s career, as it often does for those who rise fast and strong. 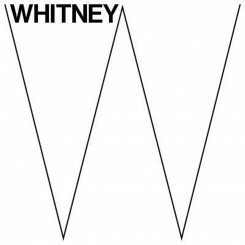 Certain art reviewers have said Wiley’s work is more for the sake of “entertainment” than high art, and others have critiqued his Warhol-like removal from the work (apparently he travels with a band of studio assistants, who also do much of the painting) and his constant repetition of the same concept, as in “Insert African-American male in _____ history of portraiture” may be beginning to lose its potency. The grandest painters of art history repeated the same motifs, the same style, the same subjects, over and over, and that sort of consistency made them memorable, not to mention easy to classify in the history books. How many gardens and haystacks did Monet paint? How many portraits were in Sargent’s oeuvre? 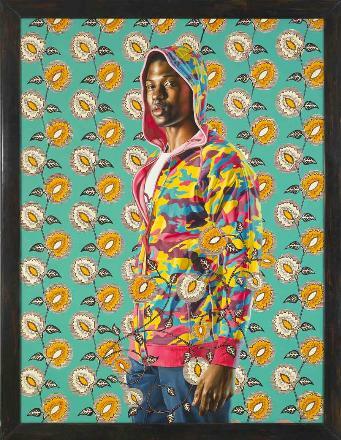 Kehinde Wiley’s repetition might feel uninspiring at this moment in time, but it will work perfectly to give the painter a place in the canon. This would be suitable, given how art history has been an essential factor throughout his seven-year career.